This is my all time favorite Summer pasta. It screams simple Summer goodness, does it not? It’s a lighter and flavorful pasta dish, with tons of fresh sweet cherry tomatoes roasted to perfection. Roasting the tomatoes makes them super sweeter, which is great for a suedo sauce in this dish. 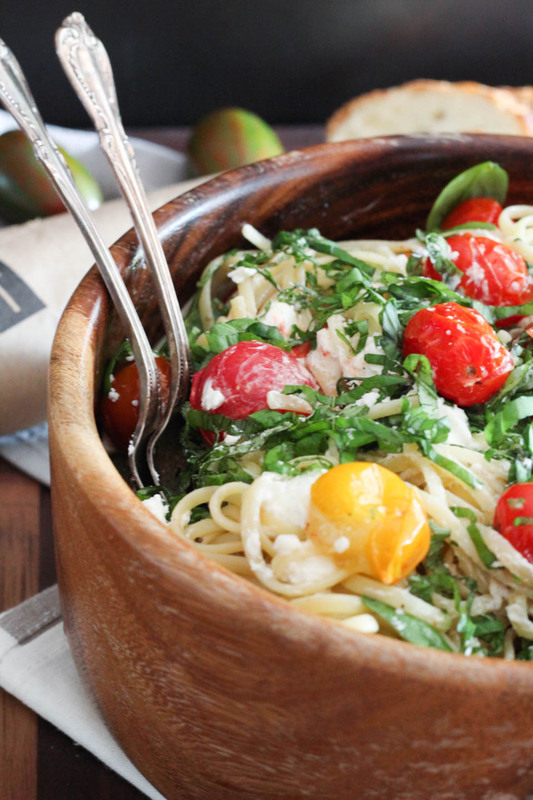 Adding the tangy and slightly salty goat cheese, earthy spinach, and bright basil made this everyones favorite pasta. You can certainly add more spinach if you wanted a bit more greens and not serve a salad with this dish. Making it on a Sunday would be perfect if you did need leftovers for lunch, and having a smaller family. No sad lunches that week! I also have made it with wheat pasta and other varieties. While a very good quality white pasta is my favorite, if you are looking for more whole grains in your diet, it’s all good to sub it here. It will be tasty too! Place oven rack in top third of oven, preheat to 450 degrees. 1. Cook pasta, and reserve 1/4 cup of the pasta water after cooking. While pasta is cooking place cherry tomatoes, 1 tablespoon olive oil, 1/4 teaspoon fine sea salt on a parchment lined sheet pan in the oven for 15 minutes. 2. Place cooked pasta, and roasted cherry tomatoes, making sure to scrape juice from sheet pan, into a large bowl. Add remaining olive oil, lemon juice, pasta water, and spinach, toss to combine. Season with a 1/4 teaspoon of salt and black pepper. Top with cheese and basil. Serve immediately. Store leftover in an airtight container for up to 5 days. So simple, but looks so fresh and delicious! I want to eat this right off the page! WOW this looks so good. Now I need to run to the store to get all these ingredients! Thank you for sharing! I love the fresh, bright flavors going on in this dish! 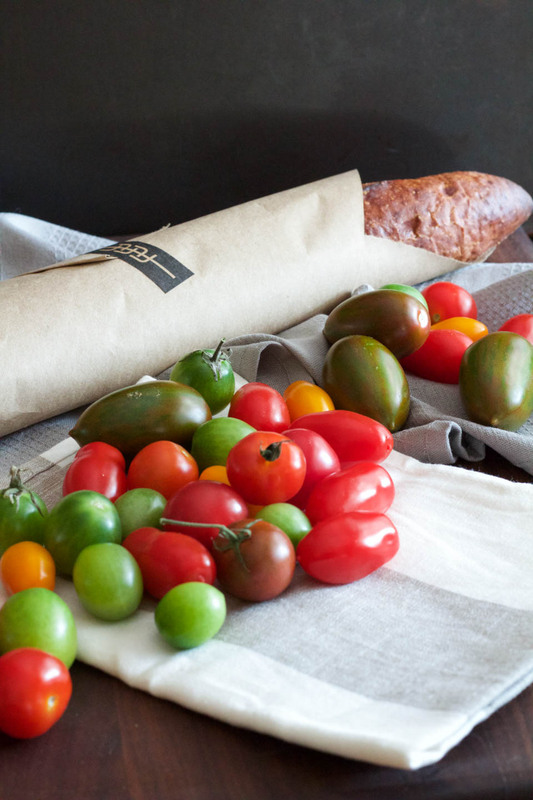 Those tomatoes look just perfect! One of my favorite things this time of the year. I also like the addition of goat cheese here. 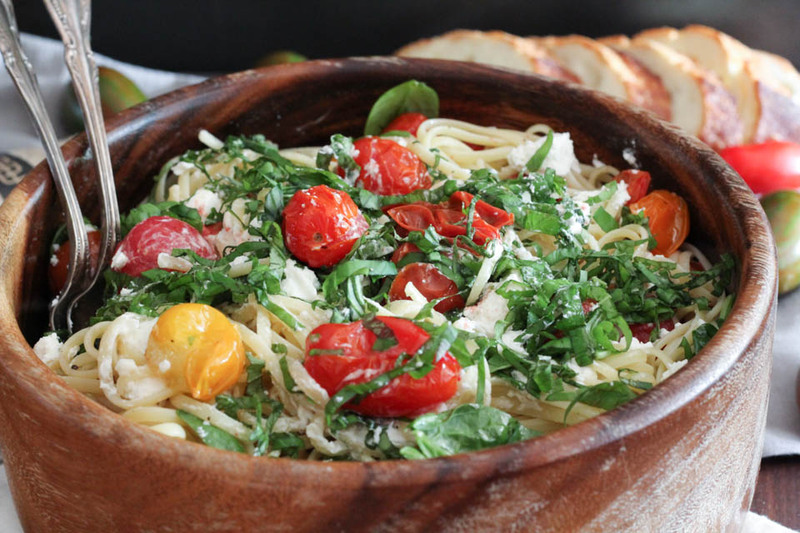 I never think of adding goat cheese to pasta – need to give it a try. I love goat cheese in pasta, the tang! One of my favorite easy pastas! I love simple pasta dishes, I love the flavours in this one! My kind of pasta – simple and full of fresh flavors. Pass me a bowl!